Daisy Ridley Thinks the Answer to her Parentage is in The Force Awakens! Daisy Ridley To Be A Presenter At The Oscars! 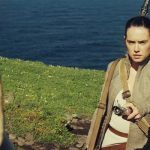 Rian Johnson Describes Star Wars: Episode VIII Plot.